70% of Queenslanders visited a National Park in the past 12 months. This means over 3.2 million of us explored, experienced and enjoyed what our beautiful state has to offer. Yet disappointingly Queensland has the smallest allocation of land to National Parks of any Australian State- just 4.8%. Our National Park land provides habitat and protects a rich variety of plants, animals and landscapes that make Queensland unique- and it's under threat. Imagine racing tracks, 4 wheel driving, commercial development and cattle grazing throughout our forests and protected land. All this the Queensland Government has in store, and the plans are in motion. Unless we voice opposition these changes, they will continue. 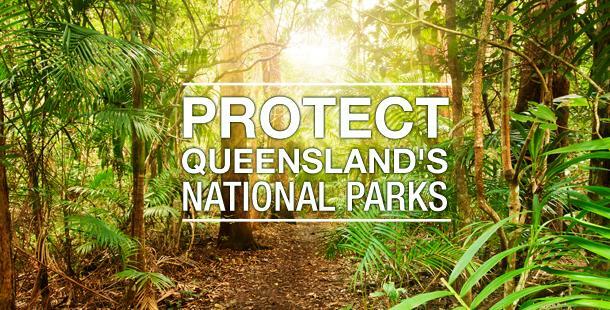 Our great challenge is to take a stand and protect Queensland's National Parks: We're not just protecting our land and native flora and fauna, we're protecting our tourism industry, clean air, fresh water, and most of all, we're protecting the future of Queensland. Keep Queensland special today, and for the generations to come. Sign the online petition and voice your opposition to the QLD Government's abuse of our National Parks!